Used both as an ornamental as well as a bush tucker plant the Mountain pepper berry trees will grow to 4 – 5m and prefer a cool climate. The pepper berries when eaten fresh at first seem sweet and then the hot peppery taste kicks in, be aware this is a hot taste, so be careful. The leaf is also dried and ground to a powder, used in breads and for flavoring meats. Reaching around 4 – 5m depending on soil conditions and climate, the Mountain Pepper Berry is an attractive small tree well suited to the garden. 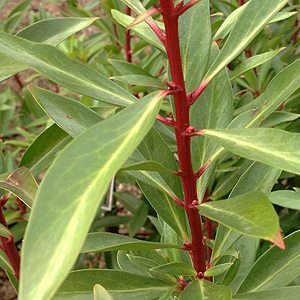 Glossy foliage, attractive new red colored stems and small creamy white flowers followed by the dark peppery berries that are finding uses as a commercial crop. These trees are not fussy about soil conditions as long as they have moisture and a relatively cool position. If you are looking at growing them for the berries you will need a male and a female tree for pollination. Flowering in spring the ripe seeds can be harvested in autumn, the berries can be used fresh or seeds can de dried for later use. Used in the manner of normal pepper it is also used in a liqueur, as an addition to mustard, in bread, pates and in cheeses. The Alpine regions of Victoria, Tasmania and NSW are ideal, however lower altitudes are also suitable given cool, shaded conditions. Plants can be left to grow into a small tree, or tip pruned to obtain a more bushy shape. Can you grow Mountain Pepper berry in a pot? Yes you can, use a good quality humus rich potting mix, they tend to be a little smaller growing in containers than in the ground. Both the berries and the leaves of Tasmania lanceolata are used. Can you grow Mountain Pepper berry from seeds? Yes, but you will not know if you are getting a male or female tree for a few years, for this reason most commercial sales are from cuttings.